"This is a family favorite and nobody knows how easy it is to make! I love that it's gluten-free!" Combine turkey, onion, carrots, potato, celery, parsley, garlic, salt, and black pepper in a large stockpot; add turkey stock. Bring stock to a boil, reduce heat to medium-low, and simmer until vegetables are tender, 2 to 3 hours. Excellent for the day(s) after Thanksgiving! 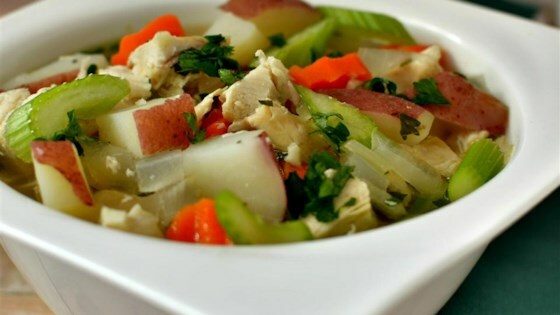 Chicken can be substituted for turkey to make chicken soup instead. Very flavorful and filling. I reduced the cooking time to about an hour, just until the vegetables are tender. Quick and easy with fresh stock and tukey. I did not simmmer for 2 hours. Just until the vegtables are tender. Super easy and pretty hearty for a turkey soup. It was a meal in itself! A great blend of flavors especially with the potatoes. I added the celery to the hot bowl of soup for a little crunch.